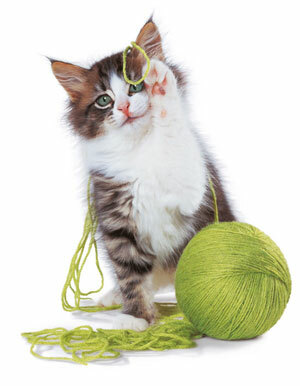 Great Cat Toys — and They're Free! You will notice that many of these toys have a "sports" theme. I'm not particularly a sports fan — but apparently my cats are. Even the most harmless toy can pose a danger to the "special" kitty who insists upon being accident-prone — so players and coaches beware! :—). Crumble a sheet of paper into a ball that can be easily carried in your kitty's mouth. Roll towards kitty. Another option. Hold on palm of your hand and flick it in an arc. This is especially appreciated by cats with a desire to compete in the World Soccer Championships. A good game of kibble hockey will have your kitties choosing teams and needing a goal keeper. My own cats have been known to spend literally hours chasing an errant kibble around the house. I have found stray kibbles under my bed, on top of the television and inside my shoes! For the kitty who likes a bit of sparkle in their life. My cats are totally fascinated whenever a Q-tip falls on the floor. And it makes no difference whether it's an unused ear swab or one that has been poked into dark places. It becomes a great plaything. Do they think it's a kitty—sized baton and they have plans to lead a marching band? Obtain an empty bathroom tissue roll. Tape up one end of the tube. Place a small handful of dry cat food into the roll so that they rattle. Tape closed the other end of tube so the kibbles can't fall out. You can also use an empty pill bottle. sides. Place on the floor. Do not laugh too loudly as your cats take turns hurling themselves into the bag. Similar to the paper bag, a box placed on the floor will soon entice your cat to play hide and seek — or seek and destroy. Make the holes either big enough for the cat to get through or very small (paw—sized), or else the cat may get stuck in one of the holes. This is funny but inconvenient. I have Writer's Block, Where's my Pencil? Cat's cannot resist a pencil or pen on your desk. Beware cats who like to chew... or one's who have something they can write about you that might be embarrassing.